In this article, we have brought together the reviews of the top 4 best youth wood bats 2019. We have shortlisted these bats after rigorous research, testing and feedback. If you are looking for a great wood bat for your young one, the reviews and the brief guide below will help you make the right decision. Brett Bros has a reputation for manufacturing brilliantly finished and well-performing wood bats. The Maple/Bamboo Wood youth bat from the company is a clear example of this. 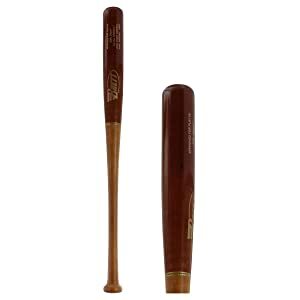 This bat features the trademark Brett Bros look with a mahogany barrel and a light-brown handle. The bat comes with a 2 1/4 barrel diameter. Brett Bros has used a three-layer laminating system in making this bat. The bamboo core provides a solid foundation for the barrel and ensures barrel performance. Also used in the construction of this bat is BOA fiberglass reinforcement which ensures long-lasting performance for the bat. On the outer shell of the bat, maple laminate is used. This brings an extra layer of sturdiness while offering excellent pop upon contact. The bat has a weight drop of -5 and features a standard knob for convenient swinging on the plate. The MBY bat is available in multiple length options. The X Bats Pro Model 98Y is another top-performing youth bat that has made our list. This bat comes constructed entirely from maple wood which offers its hallmark strength and durability. 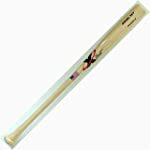 X Bats are specifically constructed this bat with a long barrel. The longer barrel ensures a larger sweet spot which, in turn, lets younger players hit the incoming baseball with greater accuracy. The overall body and profile of the bat is perfectly balanced. This gives players the ability to control the swing momentum and adds to their hitting accuracy on the plate. This bat is perfect for the young players switching from aluminum bats to wood bats. It has a barrel diameter of 2 1/4 inches and a handle diameter of 15/16 inches. The bat is available in length options of 28 inches, 29 inches, 30 inches and 31 inches. When it comes to wood bats, no list is complete with a mention of Marucci’s offerings. The company is known for manufacturing iconic wood bats that look great and perform excellently. The Youth CU26 Pro from Marucci is no different. This bat comes constructed from top-quality maple wood. Compared to other wood varieties such as ash, maple delivers a more superior hitting prowess. Each CU26 Pro bat is handcrafted from wood, giving it a feel and look of its own. To top it, each bat is bone rubbed to ensure optimal wood density. The bat has a barrel diameter of 2 1/4 inches. The barrel is complemented with a thin handle which affords players the ability to maintain a strong hold. So if you want both looks and performance for your young one, this bat is a great choice. Finished in stunning black with a pure white logo and details, the bat is available in length options of 27 inches, 29 inches, 30 inches and 31 inches. Louisville Slugger is a baseball bat manufacturer that needs no introduction. The company is known for manufacturing bats that are used by some of the best baseball players in the world. This focus on quality can be seen in this excellent youth bat from Louisville Slugger. The Youth 125 bat comes constructed from high-quality ash wood. Compared to other wood varieties, ash features a more light-weight profile which ensures greater swing speeds. Ash is also a lot more flexible which means that this bat is more forgiving for the players. The flexible profile of the bat also ensures that it packs a large barrel with a sizable sweet spot. This youth bat comes with a weight drop of minus 3. It is available in length options of 27 inches, 28 inches, 29 inches, 30 inches and 31 inches. Youth wood bats come in a wide range of weight drop options. The weight drop is the length to weight ratio of a bat. As a general rule of thumb, the larger the weight drop is the more light-weight is the bat. Similarly, if the weight drop is lower, the bat is heavier and smaller in most cases. Weight drop is usually shown as a number with a minus sign. For instance, if a bat has a length of 30 inches and a weight of 25 ounces, it has a weight drop of – 5. In the case of youth wood bats, weight drop typically ranges from -4 all the way to -10. The right choice depends on the height, weight and hitting style of a given player. What is Youth Wood Baseball Bat used for? Youth wood bats are used in youth leagues. They are a category of the youth baseball bats. Youth baseball bats come constructed from various materials including aluminum, composite, wood and half-and-half or hybrid. The aluminum, composite and half-and-half is strictly regulated so that they deliver a performance at par with the wood bats. Youth wood bats, in comparison, are not very regulated as they are already safer to use. Youth wood bats are typically constructed from maple, ash, bamboo or composite materials. If they are made from pure wood, they usually do not require an additional certification. However, if they are made from composite materials, they may require an additional certification to make sure that their performance does not exceed a stipulated limit. Aroundthebats.com is a participant in the Amazon Services LLC Associates Program, an affiliate advertising program designed to provide a means for sites to earn advertising fees by advertising and linking to Amazon.com. Amazon and the Amazon logo are trademarks of Amazon.com, Inc. or its affiliates. Copyright © 2019 AroundTheBats.com, All Rights Reserved.